Linn Cecilie Johansen originally comes from Norway but lived in France for nine years before coming over to the UK. 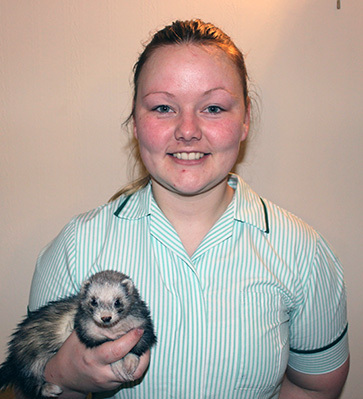 Linn is studying the Level 3 Diploma in Veterinary Nursing programme at The College of Animal Welfare’s Edinburgh centre. We caught up with Linn and asked her to share some of her experiences about her time at College, in particularly her experiences of moving to the UK to study. Why did you choose to come to the UK and study with The College of Animal Welfare? I chose this course because the UK has a more developed course that teaches more skills. I had been to Edinburgh before and liked the city; it is not too big or too small for someone coming from a village. The people here are also very nice and polite (mostly) and helpful. There is also a five year waiting time to study veterinary nursing in France. How did you plan financially/budget for your studies prior to leaving your home country? As I did not meet the requirements for getting a bursary from France or Norway, my parents offered to lend me the money to enable me to undertake the course. What advice would you give to someone thinking about coming to the UK to study? Find a city you like and go for it. It has been hard to adapt to life on my own but I have enjoyed every second of it. The weather here is not as bad as people make it out to be, and the life experience makes up for it. I have always wanted to work with animals and wanted to become a vet until I came across veterinary nursing and looked into it. I changed my mind when I discovered that nurses are the ones who mostly take care of the patients (apart from diagnosing them). I am now in my final year. Do you have any past qualifications or experiences which have helped you on this course? Being in a strict French school system for nine years has taught me good time management skills which is essential on this course. There is a lot of information to get through in a short amount of time. I have also owned horses, large dogs and ferrets which comes in handy during placement and practical sessions. Which parts of the course have you liked the most? Without a doubt, the work placement in veterinary practice is my favourite part of the programme. This course offers a lot of hands on experience and I love it. OSCE practice (practising for your final year practical exams) is also a lot of fun. Which parts of the course have you found the toughest? I find writing essays the hardest part; I have always struggled with them. Part of the reason I chose to study this course at The College of Animal Welfare is that there are more actual exams rather than essays. Practice, dedication, knowing when to ask for help and never giving up have made me a lot better. Can you tell us what your plans are for the future? When I qualify, I plan to go back to Norway and use my diploma to get a job as a veterinary nurse there. It is a lot of work and it’s tough but it is all worth it in the end. You’ll meet a lot of great people, both in College and in placement and develop skills that other countries don’t offer for the same course. If veterinary nursing is your dream job, go for it!